Former Dundee United defender Maurice Malpas has expressed surprise that new manager Mixu Paatelainen has criticised so strongly the squad he inherited. 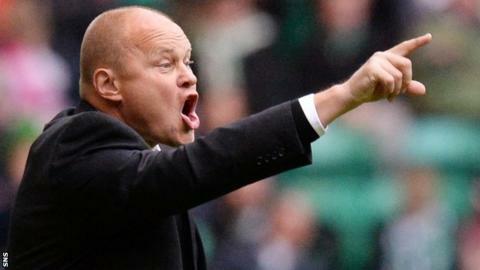 The Finn spoke out after a 5-0 defeat by Premiership leaders Celtic left United five points adrift at the foot. He described their performance as "absolute rubbish" and a standard that could not be tolerated. "I think one or two of the kids, or more than that, will go into their shells," said Malpas in response. "I've got to admit I was quite surprised when Mixu criticised everybody. "Because they've been kept in a bubble. They have been kept away from criticism and this will be the first time they've really had criticism in their short careers." Jackie McNamara was sacked with his side sitting second bottom of the table and they slipped to bottom before Paatelainen was appointed as his replacement. United have the third biggest playing budget in the top-flight, but Malpas said: "It definitely isn't a third-best squad. "I think if you look at the performances this season and towards the end of last season, you can understand why they are where they are. "The few times I've watched them this season, they've done nothing at all when the opposition has got the ball - nothing. "They've hardly had a tackle and they've allowed the opposition to dominate and virtually to do what they want." Former Finland coach Paatelainen, who has suffered two defeats in charge, also suggested on Sunday that, contrary to suggestions that his young squad was full of players with good technical ability, their skill levels were merely "okay". Malpas, who managed Motherwell and Swindon Town, told BBC Scotland: "They need to forget about the silky soccer. It's not about silky soccer, it's not about pretty patterns of play. It's about digging results out. "They've got a young back four, a young goalkeeper - they're just too young for me. There's no experience, there's nobody leading them. "Young kids, when they are going great, they are fantastic. "But, at this moment, those young players, they've got no confidence, they've no performance and the teams struggle." Much has been made of the sale of Scotland midfielders Stuart Armstrong and Gary Mackay-Steven to Celtic in January and they were followed to the Scottish champions by striker Nadir Ciftci this summer. "You've lost your two best players, but you've lost two of your so-called leaders," added Malpas. "The younger ones would have looked up to them. "I know Stuart Armstrong's a young man, but he's a very good player and, when Dundee United were playing well, he was playing well. "Mackay-Steven was slightly different. He was a match winner. "But I think it knocked a lot of the stuffing out of some of the younger ones. "I am sure the older ones would have thought they could handle it. "But, when you see the results, it proves that they couldn't handle it."